This exhibit, with additional photographs, was also on display in the Lobby of the University Library through October 31, 2000. The exhibits are a part of Wisconsin Archives Week, October 22-28, a statewide celebration focusing on the importance of the state's historical collections. 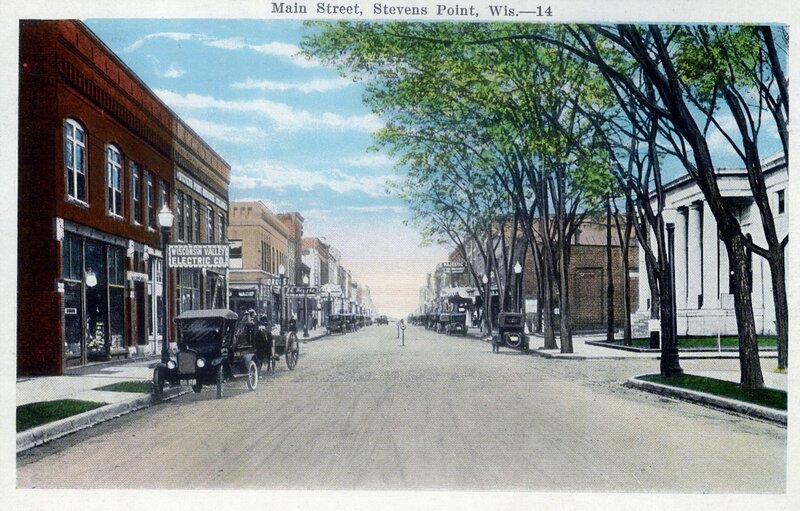 The theme for 2000 is "Main Street: Building Wisconsin Communities." 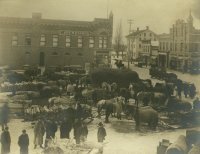 Archives and other historical records repositories throughout the state are putting on public programs to show off Wisconsin's historical treasures. For more information about Archives Week, visit http://www.shsw.wisc.edu/archivesweek/. This site commemorates the arrival of George Stevens at the head of "Shaurette Rapids" in 1839. Stevens purchases a log shack built by James Allen to store supplies for his operations up river. 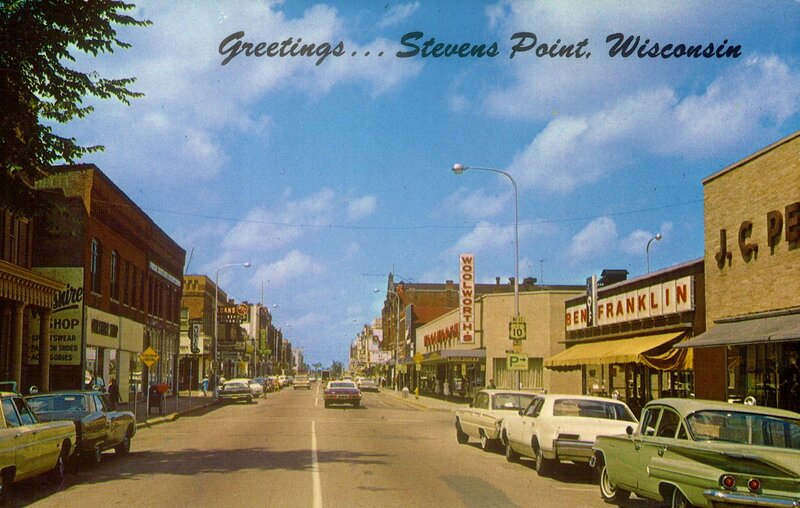 This site is located on the Wisconsin River at the foot of what becomes Main Street, Stevens Point, Wisconsin. Click on the photo for a larger image. 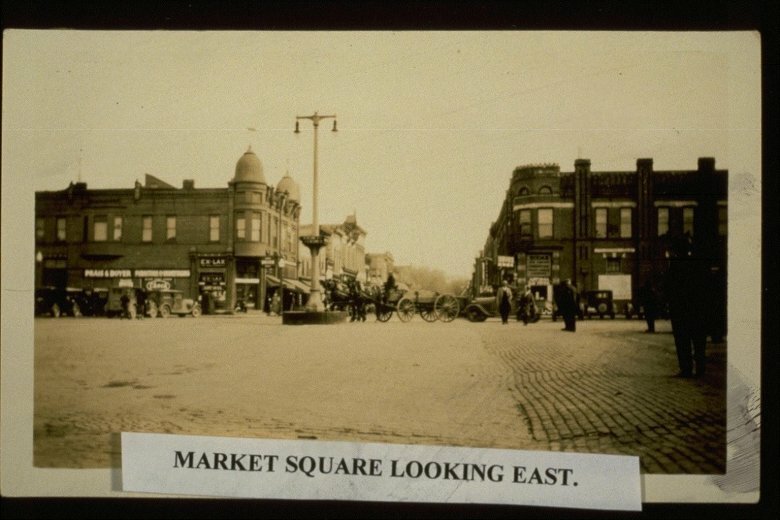 Looking east down Main Street with the "Liberty Pole" on the Public Square in the foreground. 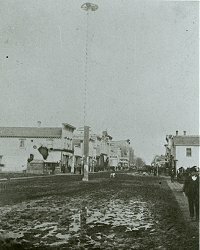 The Liberty Pole was erected June 9, 1869. The pole was made from a single trunk of white pine. 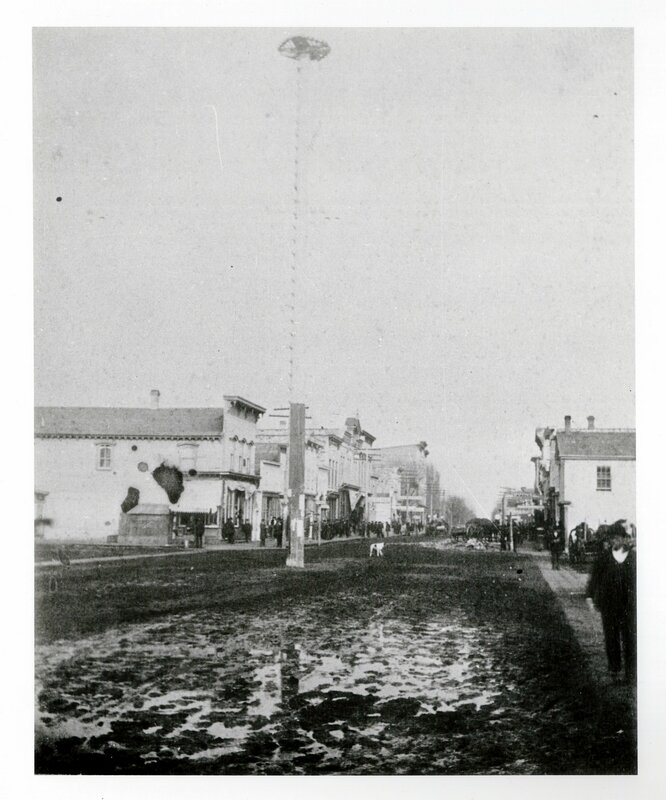 The pole stood 121-feet tall and featured a built-in ladder for bold patriots to climb. Click on the photo for a larger image. 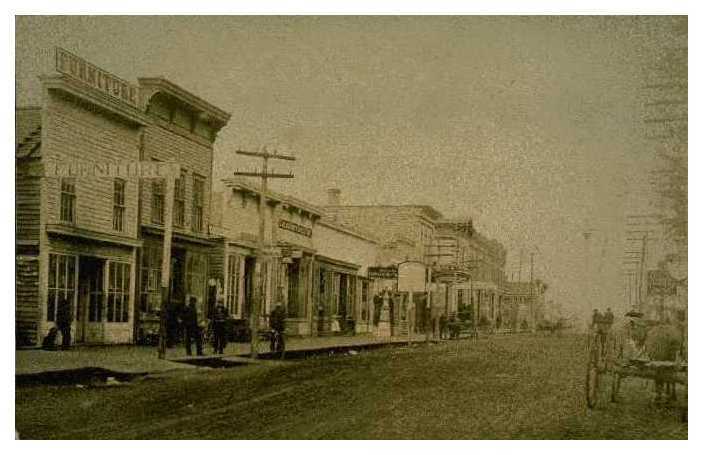 Main Street remained unpaved, as we see it here, until 1891 when it was paved with cedar blocks. 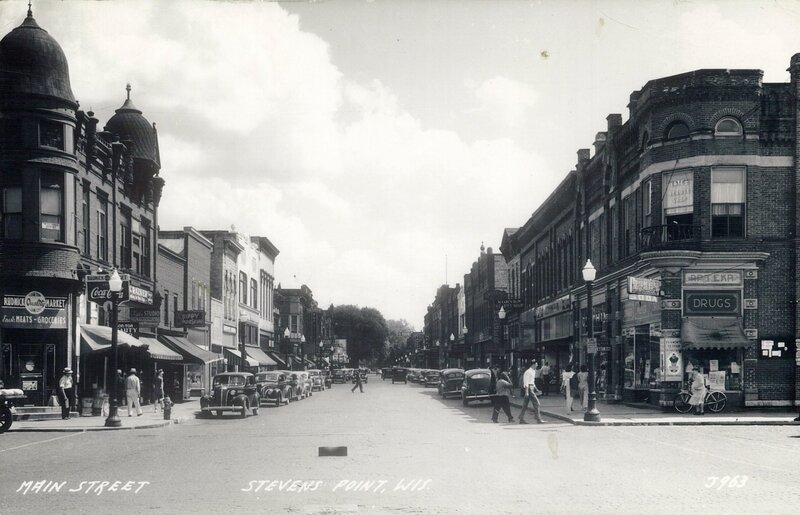 This photo is in the vicinity of today's 900 block on Main Street. Click on the photo for a larger image. The J. O. Johnsen Building dominates the northwest corner of the Public Square. It was built in 1896. Note the elaborate ornamentation that graced the building in its early days. Most of it has been removed or has fallen off over the years. In the foreground is the watering trough that was a fixture on the Square for decades. Click on the photo for a larger image. Looking east down Main Street from the Public Square. To the right is the building that housed Gwidt's Drug Store for many years. It was built by Christina Kuhl in 1885. To the left is the Ossowski-Glinski Building, which was built in 1890 in the Queen Anne style. Click on the photo for a larger image. 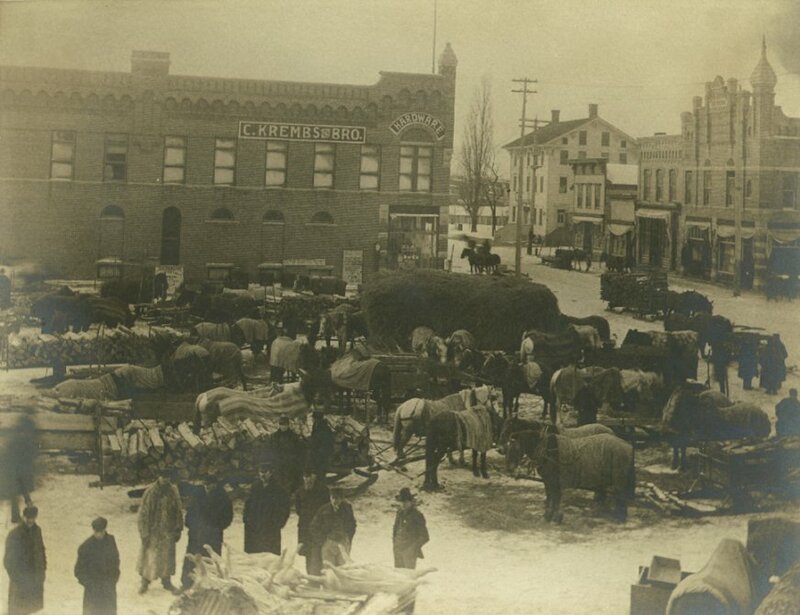 The C. Krembs & Brother Hardware Company building is located on the southwest corner of the Public Square. It was built in 1895. To the right, in the foreground is the J. O. Johnsen Building. 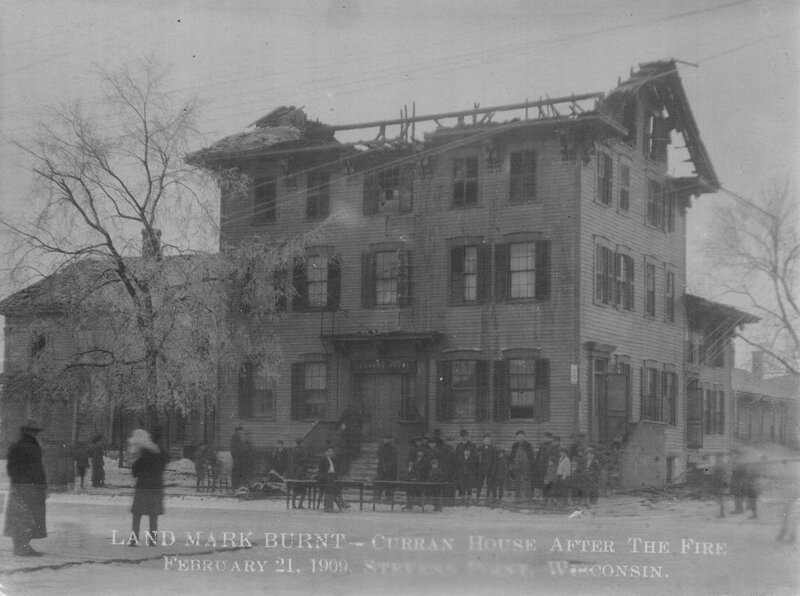 The large, white four story building further up Main street is the Curran House, which was destroyed by fire in 1909. The Curran House hosted the delegation of state officials that came to Stevens Point in 1893 to examine its suitability for becoming the home to a new state Normal School. The delegation was entertained in its fine public dining room. (circa 1896-1898) Click on the photo for a larger image. Main Street looking west near the intersection of Third Street. (circa late 1800's - early 1900's) Click on the photo for a larger image. 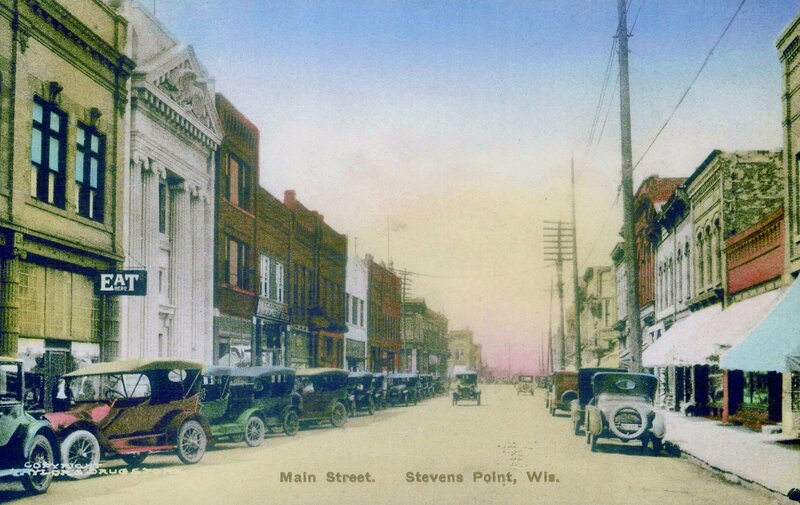 The Fox theater was originally known as the Stevens Point Opera House. It was built in 1893-1894 and served as the city's cultural focal point for many years. The Fox was entered in the National Register of Historic Places in 1982. Click on the photo for a larger image. The Masonic Temple was located on the south side of Main Street east of Strongs Avenue. It was built in 1900 and continued to be used as a Masonic temple until 1971. In 1973, it was razed and the First National Bank building expanded into the site. 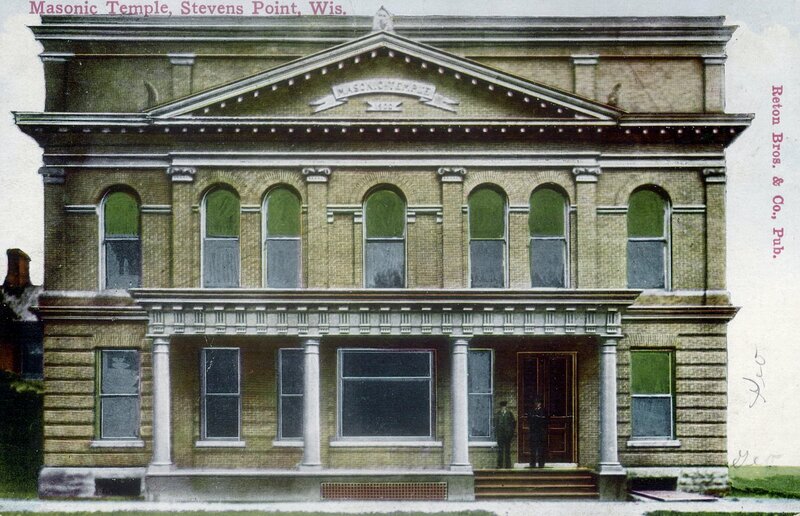 According to the Stevens Point Journal, temple members played host to William Jennings Bryan in 1905 during his lecture tour. Click on the photo for a larger image. 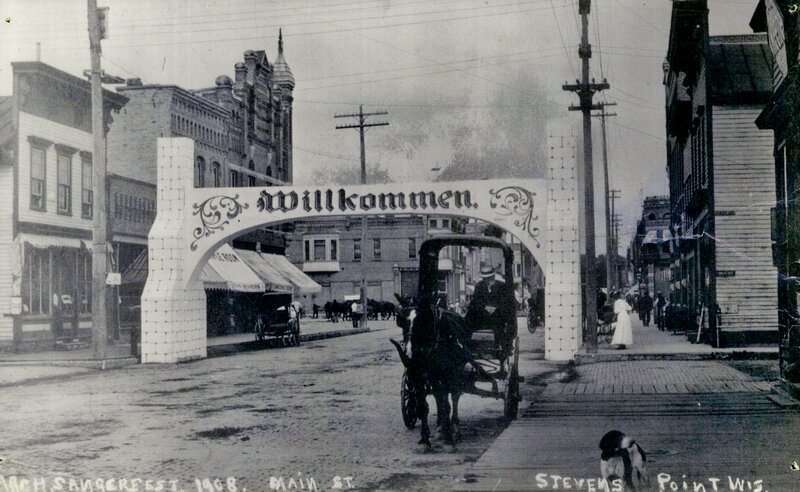 The Stevens Point Eintrachts Verein, or Good Fellowship Association, hosted the Saengerfest (German Musical Festival) in 1908. The arch over Main street welcomes Association members. Click on the photo for a larger image. 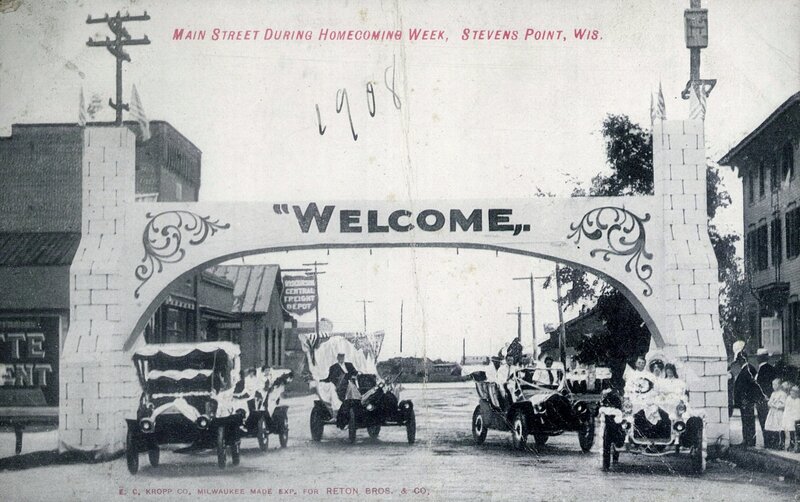 In 1908, in honor of Stevens Point's Fiftieth Anniversary as a city, a welcome arch was erected on the west end of Main Street for the city's Homecoming celebration. 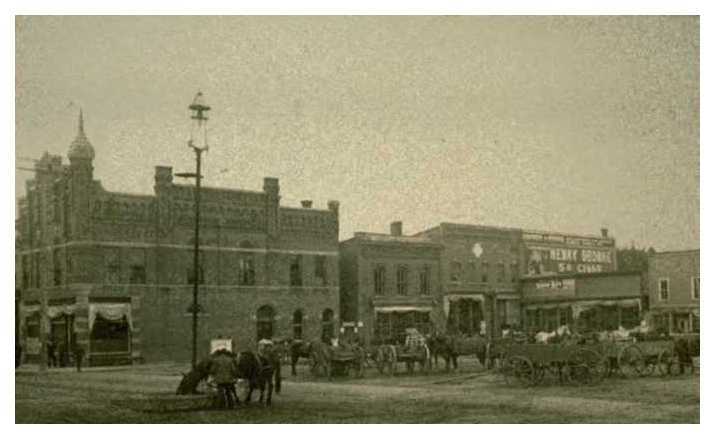 Looking west, the Wisconsin Central Depot is seen in the background to the left. Click on the photo for a larger image. Main Street looking west. To the left is the original Citizens National Bank building, which was built in 1893. To the right is the Ideal Theater at 414 Main, which was renumbered in 1965 to 1016 Main. (circa 1908) Click on the photo for a larger image. 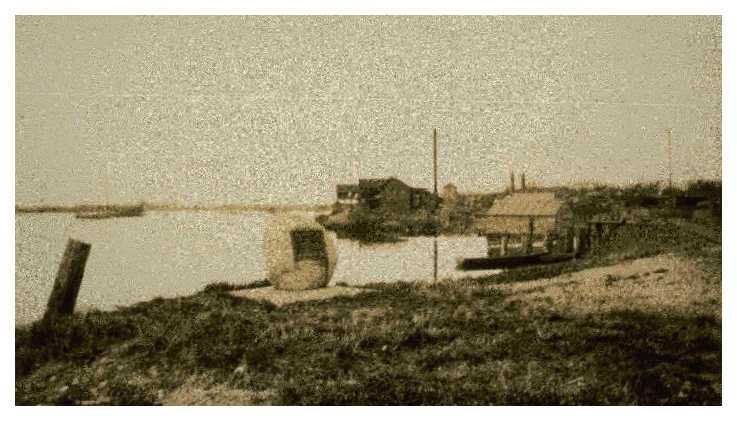 The Curran House stood just west of where the Point Bakery was located. This photograph was taken February 21, 1909 following the fire that destroyed it. In its time, it was considered one of the finest hotels in northern Wisconsin. Click on the photo for a larger image. Looking west down Main Street just east of Strongs Avenue. 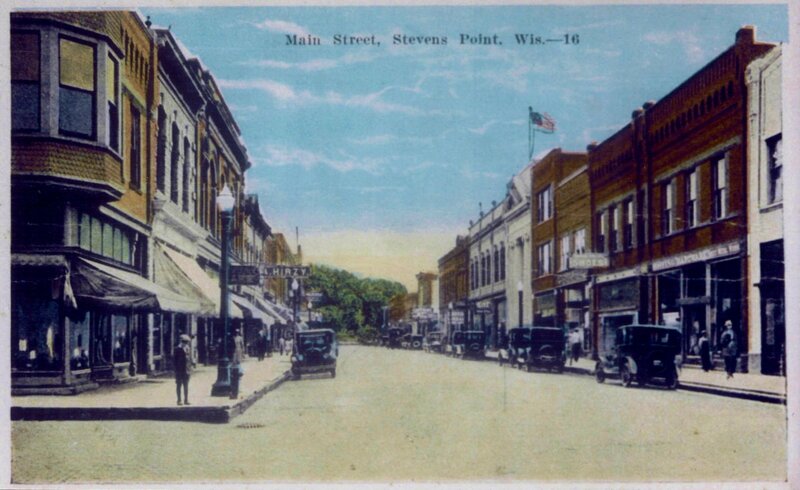 To the right is the Post Office, a classical revival structure, which graced Main street from 1913-1963. It was demolished in 1963, along with the adjacent Lyric Theater. In 1964, the F. W. Woolworth Company was built on this site. (circa 1920s) Click on the photo for a larger image. Main Street looking east from Third Street. The sign for Hirzy Jewelers is seen on the left at 418 Main, which was renumbered in 1965 to 1028 Main. Ferdinand Hirzy ran the shop from approximately 1915 to the early 1930s. Click on the photo for a larger image. 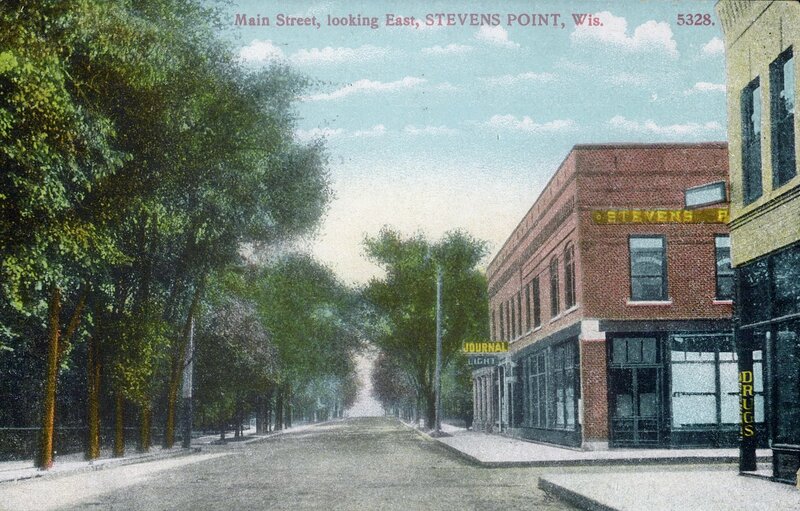 The Atwell Building on the southeast corner of the intersection of Main and Strongs Avenue housed the Stevens Point Business College from approximately 1900 to 1930. If you look closely further down Main Street, a sign reading "Journal" is seen. 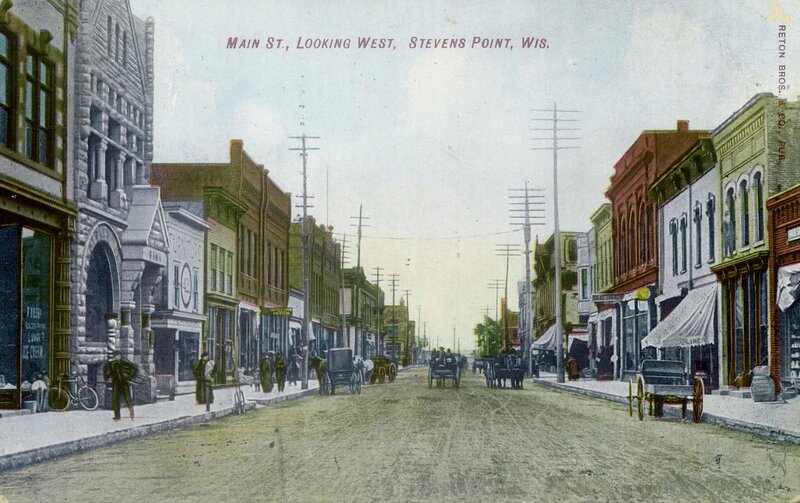 This site was the home of the Stevens Point Journal from its founding in 1895 until it merged with the Gazette in 1919 and moved to Third Street. Click on the photo for a larger image. Main Street looking west. The original Citizens National Bank facade was replaced in 1921 by the classical revival facade seen on the left. To the right of the Bank is Rosenow Furniture and Undertaking. 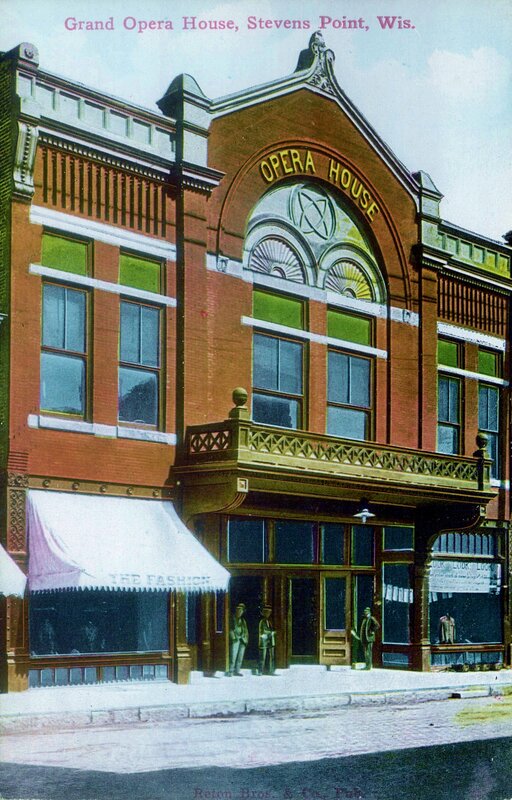 This building was built about 1915 and was one of the few three-story buildings downtown. (circa 1920s) Click on the photo for a larger image. Looking east down Main Street from the Public Square. To the left at 304 Main, which was renumbered in 1965 to 912 Main, is the Rudnick Quality Market. (circa 1940s) Click on the photo for a larger image. Main Street looking west. Barely in view on the left is the Masonic Temple, which was built in 1900. Next to the temple is the Atwell Building on the corner of Strongs Avenue and Main. On the right is the F. W. Woolworth's store, built in 1964 on the site of the old Post Office. Between Woolworth's and Ben Franklin is Union Street. (circa 1966) Click on the photo for a larger image. 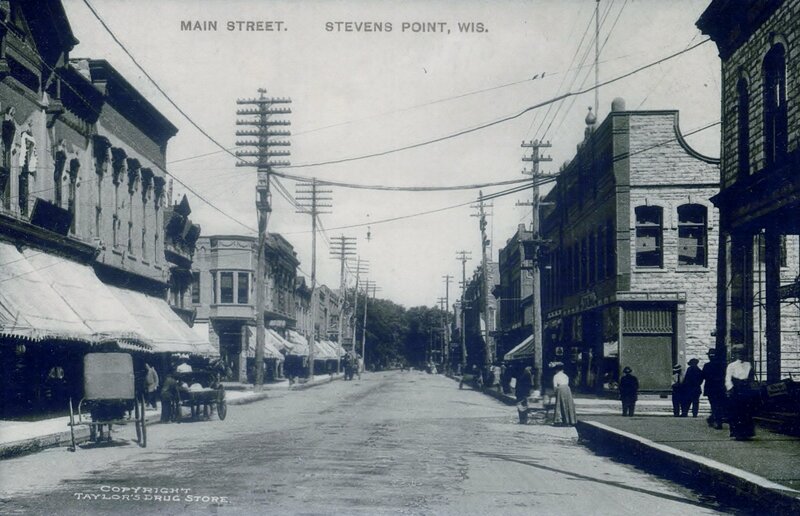 For additional photographs illustrating the history of Stevens Point and Portage County, see the Portage County Historical Society Photo Exhibit and the Web site of the Portage County Historical Society.